More and more companies, especially in the media, are trying to find new ways to attract millennials. And one former University of Missouri student is going directly to the source with her new journalism tech start-up, run by and for millennials. Launched in March, Gistory gives readers the "gist" of the news in concise stories written by journalists and contributors all over the world. KBIA's Michaela Tucker spoke with founder Zahra Rasool about where she got the idea for Gistory. I've lived away from home from seven years now, I was born and raised in Mumbai, my family's still India and I talk to my parents regularly, whenever I speak to them, our conversation inevitably goes into discussing the news because I have a journalism background. My father is updated with the news, he follows what is happening, my mother, not so much. So whenever we discussed news events, after giving my entire spiel, talking about my opinions, she would ask me, "But how did that actually start?" And after finishing the entire discussion and I would have to go back and give her a summary of the news. So that she would follow what the discussion actually was. So I kept thinking, I wish there was a place where people who wanted the news but aren't following every single detail, keeping updated on the story, could go to find that context. And even today, so many of us go to Wikipedia to get the summary of a news event or to get that context, and that's where the idea came of Gistory, but at that point, this was at the beginning of 2014, I didn't a name in mind, I didn't know what this would look like, but that was sort of the inspiration. 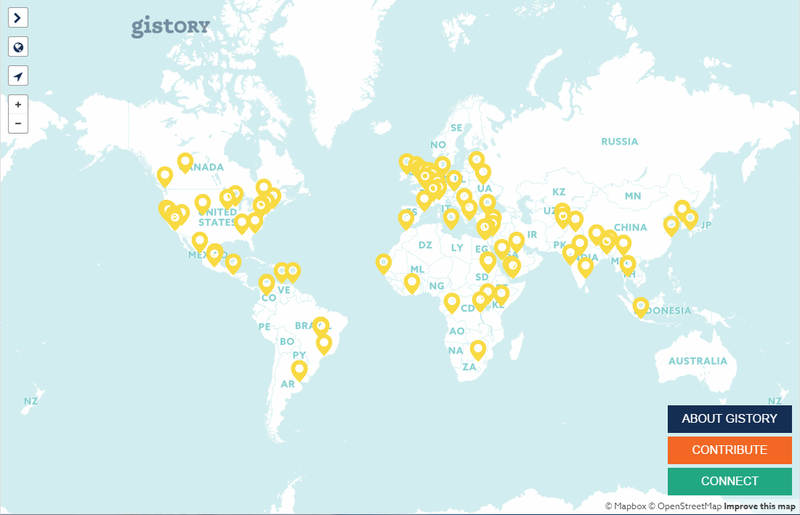 On Gistory's website the stories are displayed on a world map. Why is the map important to your work? So many of us talk about the news, we talk about countries far away from where we live, but we don't actually know exactly where they are located on a map. So many of us talk about Syria, but we don't know where Syria is on the map. And that's really important information if you want to understand the conflict in Syria to know which are the neighbors of Syria. So, that's the reason why we wanted one of the main features of History is the map. We pin our stories to the map so that you can, you know where exactly the story is happening. With the map and being a "Wikipedia-style" digital-media organization, contributors are vital. With Gistory based out of Columbia, how do you find contributors? In terms of the contributors, currently Elian Peltier, he is the managing director and the director for community outreach for Gistory. He is based in Paris, so his role is to reach to reach out to contributors who might want to write stories for us if there is a big news event happening and we think we want to cover it for Gistory, we would like to give the gist of the event on our site, he gets in touch with potential contributors and how they can go about writing a story for Gistory. A lot of the contributors are also people that have seen us online and get in touch with us with their ideas and tell us, "This is something that we'd like to write forGistory, would you all be interested?" So through that we've actually built a network of quite a few contributors, people who have already written for us and continue to write for us and contribute whenever they think there's a story that interests them. Gistory isn't even a year old, what are your goals for the future? The hope would be to build Gistory up into a more contributor-based digital media organization where we can do a lot more. We can put a lot more content for social media and make it attractive for millennials. Our hope is to be to be able to make news attractive so that young people get interested in the news and are able to follow what's happening.